On this past episode of DC's Legends of Tomorrow, the Legends were stuck in space, unable to track Savage. When they receive a distress call from another Time Master ship, Rip decides they're going to try a rescue. But not everything is as it seems, and not everybody is as they seem. Can the Legends band together to survive the depths of space and their own personal struggles? Let's find out. To the spaceship! Warning: includes spoilers for DC'S Legends of Tomorrow. Let me just start off by saying, this episode was more shocking than I was expecting. Not only do we see a deeper side to Rip Hunter and his past, but the tensions are high in the episode for certain team members, and I was not expecting that ending. First off, Rip Hunter. 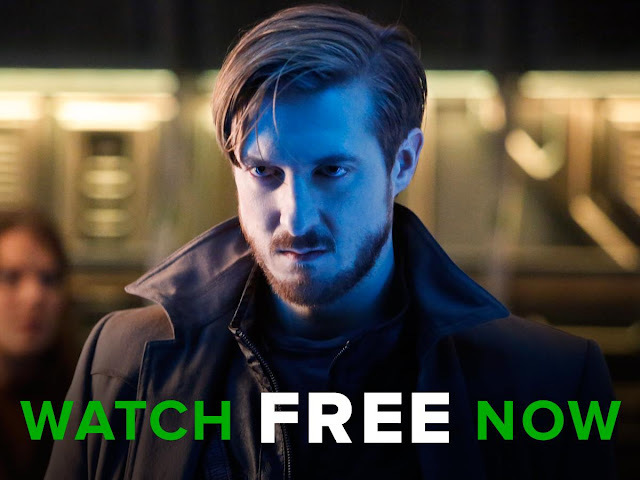 This episode was heavily focused on Rip Hunter and his story. Arthur Darvill is my favorite person on this show. Not Rip Hunter. Arthur Darvill. He sells the part so well. He's grown so much. He does such a fantastic job of making me feel for Rip's loss but realize his balance is way off. He's grumpy, he's moody, he's angry--and he lets it rule him. But still, watching a piece of his past come to light was devastatingly beautiful. It's kind of like a fairy tale, but sometimes, I think the world still needs fairy tales. Rip: "I vowed to save my family, but I'm failing them. Perhaps I'm not the Time Master they need." Stein: "You must be. You're the only one they have." It was also interesting to learn more about the Time Masters. They're very elusive and frankly, annoying. (Or at least the Council is.) I suppose anybody is if they just sit around and let things happen. The reason I like the Legends so much is not because they can easily band together to save the day. They still make mistakes; they still get mad at each other. But undoubtedly, they do something. They get up, they move, they fight, they try. They don't hesitate. They don't sit by and just let things run their course. They just go for it. I love it. Also, the Time Masters are basically the Jedi Order and the Time Lords mixed together. So...corrupted, stingy guardians that hide from love and emotions and don't do anything. Yep. Time Jedi Lord Masters. Sara and Snart playing cards together is my favorite thing. Rory getting mad that he can't light anything on fire is my second favorite thing. My third favorite thing is the amount of Star Wars and Star Trek references in this episode alone. Even Kendra rocked the fandom references, which was amazing. (See, pretty girls can be nerds too.) And Ray--adorable, cupcake puppy Ray. Ray: "Captain's log. Stardate 837.9. We're waiting word from the away team aboard the Acheron." Kendra: "I hate to break it to you, but you're no Captain Kirk. You're Picard." Ray: "But Picard was cautious, pontificating, sort of sexless." Kendra: "Well, tell that to Vash. And for the record, Picard was way hotter than Kirk." Rory: "Do I look like a Time Master to you?" Valor: "You look like the kind of man who'd throw his grandmother out of an airlock." I like that every episode pairs different people to work together. We get to see everybody interacting with everybody. Sara and Snart share what they think could be their last moments. Kendra and Ray work together to save Sara and Snart. Rip and Jefferson work to escape the brig--okay, and to keep Rory calm. And Dr. Stein--or should I say Space Ranger Stein? He saves the day, which was the best surprise of the episode. Everybody in this show gets the chance to be the ones saving the others. Everybody interacts. They work together, they learn, they try. This is like the "real" side of heroism. This is what it means to come together as a team, which we don't see a whole lot in team-ups sometimes. Yeah, sure, the Avengers have their differing opinions, but once the fighting starts, they mesh together to save the day. Even Team Arrow and Team Flash cleanly work together to get the job done. But the Legends have to fight because they quite honestly probably have no idea what they're doing. They're still in the process of figuring things out. However, the biggest twists were with Rory and Snart. Now, we all know Rory is a little on edge, especially recently with the 2046 incident. (Aka Snart wouldn't let him stay in the terrible future.) It all seems like he's just throwing a big temper tantrum. But this episode really made me give Rory a second glance. People don't treat him that well--I imagine they never did. They think he's "dumb" or "grumpy." But he does work hard with the tasks given to him. And he's fed up with everything. So I did feel bad for him, for the way he's been treated. For what Rip called him. He may be grumpy and a criminal and focused on one thing, but he was still part of the team. He helped Ray survive prison (even if Ray didn't always listen). He helped the team get the dagger--even if they didn't stop Savage with it. He's helped the team just like everybody else. He has some of the best lines, his grunt work gets the team out of trouble, and he's tried in every situation. He has merit. Yet, Ray is the only one who doesn't treat him like packaged meat. It's sad. Rip: "Or what? You'll punch me in the face, or burn me alive, or employ some other barbaric form of violence?" Rory: "That's why you recruited me, isn't it? To hit, hurt and burn?" Rip: "No, I recruited you because you and your partner were a package deal. I'm sorry, Mr. Rory, but a serial arsonist was never part of my plan to stop Savage, much less one with the IQ of meat." The ending shocked me because I thought for sure Rory would turn. He would trick the pirates and help save the day. But he didn't. He wouldn't change to fight for his team. And even Snart turned his back on him, choosing the Legends over him--the guy who saved him from death. So the ending was so sad for Snart's sake. This was his best friend, his partner in crime (literally), the only person who truly cared about the things he did. I didn't think he would do it. I didn't think he would kill Rory. (Still, I'm not so sure he did.) But he did blast him, making it seem like Rory's gone. And it's just shocking. I was slightly miffed when Carter died. But only because he was featured in the promos and posters as a cast member. But this was worse. This cut deep because Rory's been with Snart since day one. They've always been together: Captain Cold and Heatwave. After what Rip said and Snart did, it does seem like Rory was just another expendable character, a part of the package that included Snart, the true prize. And it hurt. Because this is the show where anybody--an assassin, a criminal, a barista, a scientist, a failure--could be a hero, could save the day. But Rory could never be a hero, could he? Snart: "I should've left Mick in future Star City." Snart: "Without me to keep him in check, Mick can be a scary guy." Sara: "Agreed. Hate to break it to you, but even if we make it out of here alive, you're still gonna have a problem on your hands. And I've seen enough to know that Mick's in a dark place. He's not coming back." In addition, the Legends fought off the time pirates by opening the airlocks, which sucked them into space. It was harsh, cold even. I was utterly shocked when they just whisked them away like they were garbage instead of people. While I know they were in danger of dying themselves, what good is it to kill people when you're trying to stop someone else from killing people? It made Rip and his decisions seem even less heroic. This episode had good and bad to it. There were great moments of swanky space adventure. There were important, intimate moments of sharing thoughts and feelings. There were harsh moments of death, betrayal, and rejection. The Legends aren't perfect. And this episode showed what kind of consequences result from such imperfections. I think this episode, more than the others, shows a deeper, darker side to heroism. There isn't always hope for everybody. There isn't always the chance to save lives. But still... they try. What did you think of "Marooned"? How did you feel about the end of the episode?